On Monday October 17 we held our first Elite Approved Installer Awards at the National Self Build and Renovating Centre (NSBRC) in Swindon. Winner of the SureSet Elite Approved Installer of the Year Award was GLW Landscapes Ltd.
Runner up of the SureSet Elite Approved Installer of the Year Award was Botanica Resin Bound Driveways. 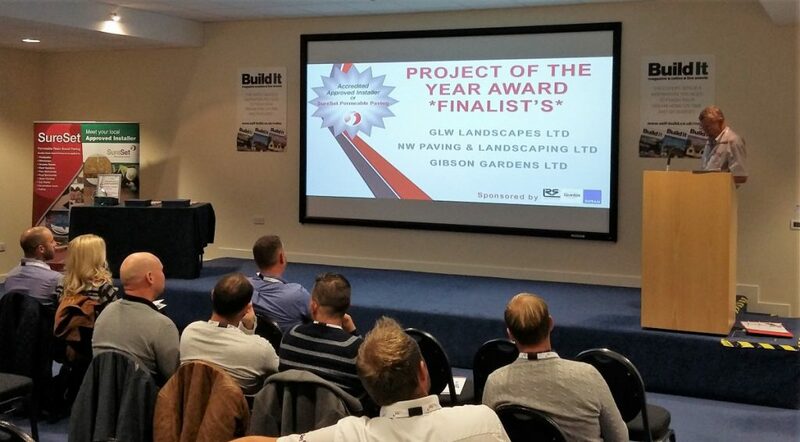 Winner of the SureSet Project of the Year Award was NW Paving and Landscaping Ltd. Winner of the SureSet Outstanding Customer Service Award was Botanica Resin Bound Driveways. Winner of the SureSet Spotlight Award was Nigel Walker, NW Paving and Landscaping Ltd.
“The venue was a good one as I in particular found the stalls very educational and potentially useful with regards to some of the products and suppliers on show. So once again well done to you and all at SureSet and looking forward to seeing you all again in 2017. “Alice and I would like to thank you for your hospitality at the event and as SureSet are a valued customer of ours, we felt it important to offer support. We felt overall the event went very well, especially as this was your first attempt. We were very happy with the venue and found the ‘tour’ very interesting. The presentations came across very well and all Sureset staff represented the company positively. Based on a set criteria – most importantly, customer feedback – we have been recognising one company as our Elite Approved Installer of the Year for several years now. But due to the growth of SureSet and our network of Approved Installers, we decided to take our Installer of the Year Award to the next level with this first Annual Elite Approved Installer Award Ceremony.